If you’ve ever wanted to trek through a prehistoric world, armed only with a rifle and a truck load of courage, the Jurassic Island slot might be the one for you. Join an expert dinosaur hunter as he attempts to bag prized specimens and turn them in for big prizes. Visually the slot is rather standard. It features a typical layout of 25 pay lines across three rows, and five reels. The music, and adequate art work add a good deal of atmosphere to the game, but it’s the extensive bonus features that really allow this one to shine. There’s a total of four mini games included within Jurassic Island, and the good folks at Playtech even included a stacked wild feature. Feature rich – Jurassic Island offers one of the best selection of innovative game modes around. Great atmosphere created by visuals and music. Lower base game prizes. Five-of-a-kind in the regular game mode won’t win you a life changing amount of money as it will on some machines. Little scope for changing betting sizes. Fixed number of win lines, limits the ways you can bet your money on Jurassic Island. Green dinosaur = 1,000x the line bet. Purple dinosaur = 300x the line bet. Blue dinosaur = 300x the line bet. Red dinosaur = 150x the line bet. 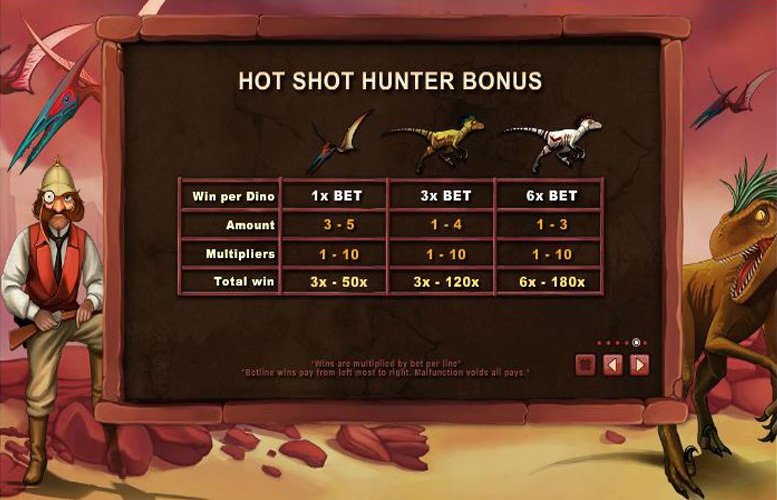 Dinosaur skull = 150x the line bet. With the highest line bet being £5, the largest possible base game win is a meagre £5,000. Obviously, dropping such a prize would be fantastic, but when compared with some of Jurassic Island’s peers, the four-figure top pay out seems small. Undoubtedly one of Jurassic Island’s greatest features is its bonus rounds. There are a lot to get through, and they’re quite different from the regular free spins, or “pick a box” style bonuses many will be accustomed to. First off, let’s talk about the expanding wilds feature. This is somewhat standard in many games today but it’s still a strong and enjoyable way to improve the slot’s overall RTP rating. The wild symbol itself is a brown dinosaur with green Mohican hair style. It only appears on the middle three reels, and will expand to fill the whole reel if a win is possible using the wild across any of the win lines. If players are fortunate enough to land three or more “scatter” symbols anywhere across the reels, they’ll be given the option to play one of four different free spin modes. The scatter symbol itself is represented by a moustachioed dinosaur hunter, complete with monocle, and formidable looking rifle. The more of these scatter symbols you land, the more powerful the feature you select will be too. 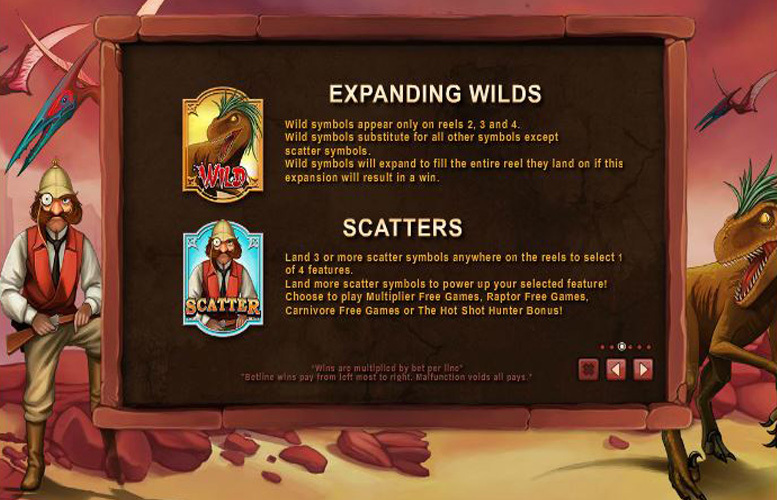 Multiplier free games – 3, 4, or 5 scatter symbols will award 10, 15, or 30 multiplier free games. During the games, all wins will be multiplied by three. Landing additional scatters during this mode will trigger more free games. Players should beware, Playtech consider this mode one of high volatility. You might not win every time but when you do, it should be a decent sized pay out. 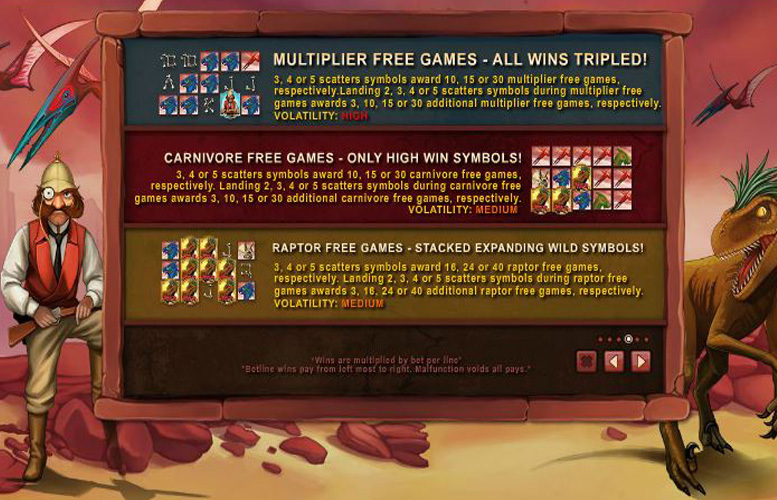 Raptor free games – 3, 4, or 5 scatter symbols will award 15, 24, or 40 raptor free games. Here wilds are stacked and expanding. This makes for considerably more chances to win. This game is considered medium volatility, making it a safer bet for those who’d rather avoid the highest variance option. Carnivore free games – 3, 4, or 5 scatter symbols will award 10, 15, or 30 carnivore free games respectively. Here, only the highest value symbols will feature on the reels. Obviously without all the lower prizes out there, your chances of a decent win are much greater than during the base game. This feature is one of medium volatility. The hot shot hunter bonus – this mode takes a slightly different approach. It’s a mini game where players must shoot dinosaurs as they cross the screen. Each gives a cash prize with different multipliers possible. These prizes soon add up, particularly if you’re able to hit the 150x multiplier. Unfortunately, one of the weaker aspects of the Jurassic Island slot is the lack of options a player has when it comes to making their bet. Being as the slot utilises several unique features, the win line number is fixed. That leaves only the actual bet per line option to play around with. There are several to choose from, the lowest being 1p, and the highest £5. This makes the highest spin possible an impressive £125, and the minimum cost per play is 25p. Jurassic Island caters to all bank balances, despite its lack of customisation when it comes to stakes. 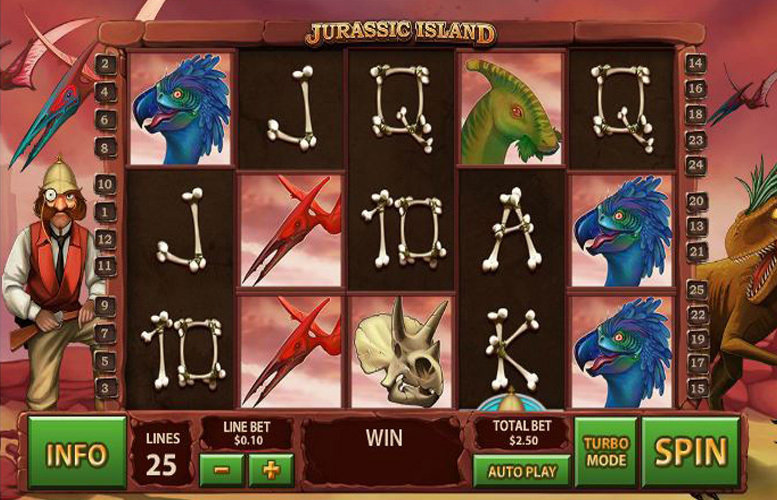 The Jurassic Island slot is a great machine for those who enjoy the most variety from their slot machine play. There’s a wealth of innovative bonus rounds, and the overall look and feel of the slot makes it one of our favourites in Playtech’s catalogue. There is the small issue of betting variants, and perhaps there could be a touch more animation here and there. For those reasons, we’re awarding Jurassic Island a close to, but not quite perfect score. This game has a rating of 5 / 5 with 462 total reviews by the users.